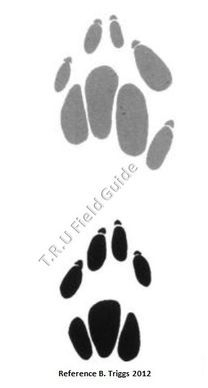 Please see below a representation of what a Thylacine print should look like. Note that the toes should face slightly inwards and look for the presence of dermal ridges in the pads. The vast majority of prints that we see are dog prints or wombat prints. There are many wild or feral dogs in the wilds of Tasmania and other parts of Australia. Another characteristic of animal feet is the axis of the toes. On a canid or felid foot the junction is just behind the planter pad - as in the top image immediately below. Note the singular, tri-lobed planter pad. This print is from the magnificient survivor e-book. 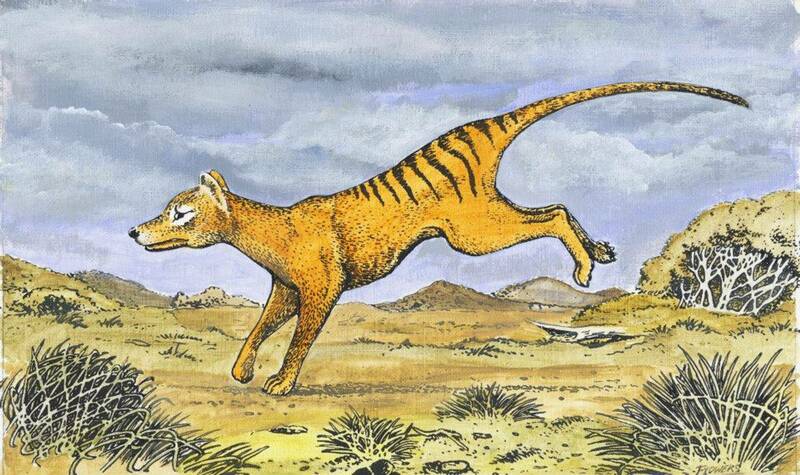 It looks like it could either by Tasmanian devil or Thylacine. Found close to Cradle Mountain - is this a thyalcine rear print in the snow? This print was sent in with a large trackline. Some 400-500mm between prints. Analysis suggests this is a running adult wombat. This print is held in the hand of well known Thylacine expert and biologist Nick Mooney. Nick suggests that this is etiher Thylacine or a fake - in either case he is suggesting that this is what a thylacine print should look like. It looks similar to the Tracker Scount prints - although this one is shown well after the Tracker Scout prints were destroyed in the early 2000s. Close examination appears to show a different substrate. Reported as a potential thylacine print - this is most likely an adult wombat print. This print was the subject of a range of videos and experiments from the team. Whilst initially hopeful the team concluded it was mostly likely that of a large dog. 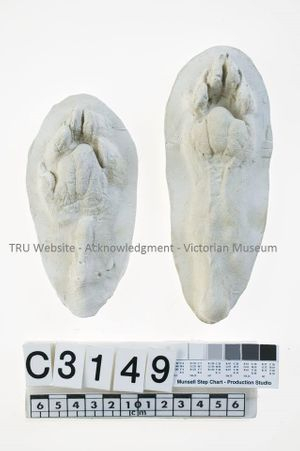 These are casts from the Victorian Museum, of a 20kg freshly dead thylacine. These prints are used as the official reference prints by the Tasmanian government. Nick Mooney would frequently send a photocopy of the print to people who had submitted prints in the hope of them being found to be thylacine. This print was submitted with a message - saying 'I know where he lives'. TRU assessed that the print belongs to a wombat. These prints were first reported to the team by Tracker Scout. The image is from the documentary Devil's Island. In the show Rusty explains how he took the casts and destroys the casts in order to protect the animal. The prints have cause some controversy as Rusty indcated in a Facebook chat that the one on the left could be fake. This assessment was made as he did not see the animal that left the print. As opposed to cast on the right where he saw the animal by the side of the road. Some have accussed Rusty of faking the left print , however, analysis of Rusty comments clearly show that he is suggesting it COULD be a fake and not that he created it. Regardless, it looks very similar to the reference cast and the Mooney print. 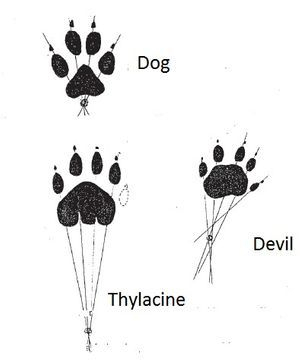 This image of a thylacine foot was used to compare to a footgraph in Col Bailey's book - Shadow of a Thylacine. It shows the front foot of a thylacine. Note that the 'creases' or groves that divide the singular planter pad into three lobes are faint here. This most likely due to drying of the speciman. This image of a thylacine foot shows the extensive and long hair on the foot. One would expect therefore it would be possible that hair samples could be left in prints. From an early drawing undertaken as part of scientific research - this drawing shows the lack of webbing between the toes and the tri-lobal nature of the thylacine foot. This particular photo shows a front and rear thylacine foot. On the front leg there is a distinctive line that appears to be a legacy of the taxidermy process. The front pad is missing the obvious separations in the planter pad which highlights the different ways that specimans are preserved.